Florida Bee Removal specializes in live removal and relocation of bees in Davie. In addition to bee removal (including Africanized bees) we remove wasps, hornets, yellow jackets as well as bee hive and honey removal. 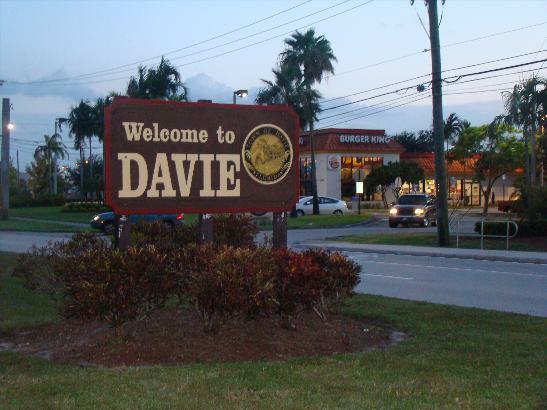 We are licensed and insured and perform bee removal service not only in Davie, but the entire state of Florida. Call Florida Bee Removal whether you need bee removal services, or perhaps you have a bee swarm or yellow jacket nest on your property and would just like additional information. We have been in the bee removal business over 50 years and enjoy every bee removal adventure. You are never a bother to us, we love the phone to buzz for bees! If you are located in Florida, you come into contact with bees. It’s just a fact of life. Sadly, you don’t know if you’re dealing with aggressive bees or non-aggressive bees until it’s too late. At Florida Bee Removal, our experts are highly qualified and properly trained in safe, effective bee removal techniques. We offer same-day service at a fair price. When we can safely and effectively perform it, Florida Bee Removal prefers to practice live bee removal of the bee hive if at all possible. When we have safely removed the live bees from your property in Davie, we turn them over to a local beekeeper so they may be safely managed. Our goal is not to exterminate bees, rather remove the danger of the bees from your property and keep them in their natural habitat so they can continue benefit our evironment. Other stinging and aggressive insects such as wasps and yellow jackets must be exterminated and removed from the site. 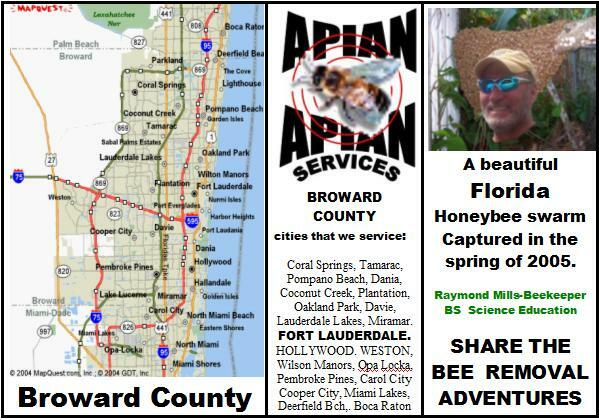 Apian Sting Operation and its parent company, Appalachian Spring Bee Services, have been in business for over 40 years. We were pioneers in the establishment of bee problem resolutions statewide. Today, The Sting Operation maintains a highly skilled team of beekeepers, trained and certified to settle beehive or wasp problems wherever they may occur, in Florida. Broward County has developed into a thickly-populated urban area. This region remains highly concentrated with commercial beehives, especially during the fall, when the Brazilian Pepper Trees bloom profusely. Today, many citizens fear the presence of beehives near their homes and businesses. Apian understands these concerns but also wishes to emphasize the importance that honeybees play in keeping our environment in balance. Honeybee pollination ensures us of an abundance of produce and feed for animals, etc. Our quest is to remove wild bees from areas of concern and to encourage best apiary management practices to protect both humans and bees. Bee Removal has been an enjoyable pursuit since 1963. The author, pictured below, transferred his first honeybee colony at age 18. Yellow jackets are members of the hornet family (Vespula). Although adults sip sweet liquids; (you may have seen them enter your soft drink container); they do not store surpluses of honey nor produce wax or royal jelly. Instead, they harvest flesh and other insects which they masticate and feed to their brood. The eggs, larvae, and pupae are completely dependent upon the adults for nurturing, climate control, and colony defense. The sting of a yellow Jacket is more painful and irritates longer than that of a bee. Many venom-induced deaths are the result of multiple stings from these defensive insects. You had better run fast if you wander into one of their nests. Yellow Jackets have a wide range of habitats. Apian has observed nests as large as compact cars beneath modular homes, fashioned around palm trees, hiding among pampas grass, burrowing in fern beds, wrapping themselves in old rolls of carpet, enveloping their nests in wall voids, hanging from cypress limbs, and in open areas as subterranean colonies. Our team has made several attempts to transfer colonies of Vespids without success. Vespids (yellow jackets, hornets, paper wasps, and mason wasps) do not appear to adapt to new locations like bees do. Exceptionally, the bald-faced hornet relocates nicely. Apian has often transferred entire nests while observing very little break in their foraging or reproductive behaviors. Following relocation, the hornets will be ill for about a week. They will chase after anything or anyone that approaches them during this attitude adjustment period. Most Vespids, as well as bumblebees, diminish in the late fall to only the gravid (reproductively viable) females. These individuals seek a protected resting place to await a new spring and a biogenesis of their species. The over-wintered females forage, construct a nest, and lay their first eggs. When the emerged new adults reach foraging development, the queens dedicate their activities to egg-laying.